Hey everybody! We’re here safe and sound in Japan, the earthquake shook us up quite a bit but everyone’s ok in our area. It’s pretty crazy watching the pictures come through on TV. 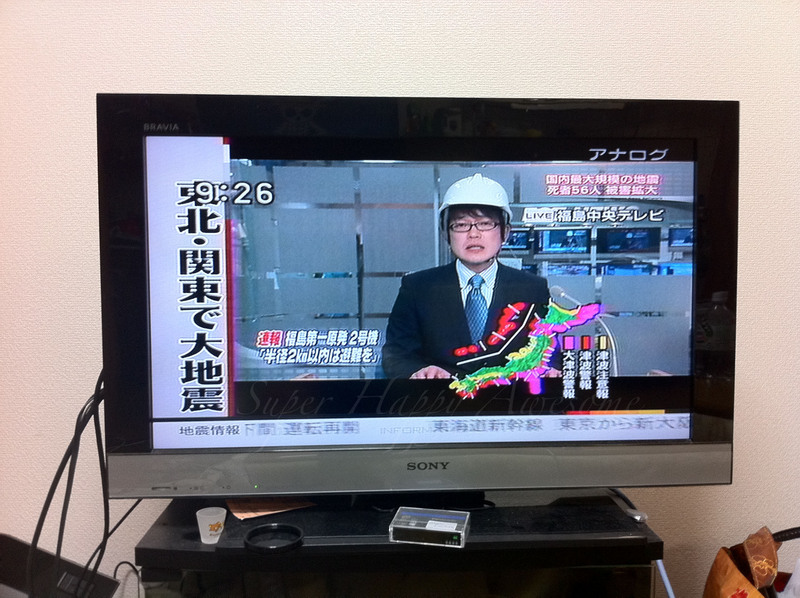 Even the reporters on TV are wearing helmets! This entry was posted in Adventure! and tagged Earthquake, news, 地震. Bookmark the permalink. 9 Responses to Day 0: Earthquake! 地震! I’m glad you all are alright. I was up around midnight when I got the first tweet about it from innocencewalker, I think. Or one of the guys from Monkey Majik. It’s insane how fast someone like me on the East Coast knew about it thanks to Twitter… but I’m glad everyone’s safe. The broadcasters are wearing helmets?? Aw. As a sign at a nearby construction site says, Safety Primal! It’s kind of adorable–this dude in particular looks so scared! Glad you’re safe in Nagoya! Are you guys still getting the aftershocks? Glad you’re ok. Mom’s saying prayers for everyone! Aw, say hi to your mom for me! Thinking of you guys! I’m glad you guys are ok ^.^I miss you guys lots!